Your Gold Listing provides great value for your money while maintaining high visibility. premium search positioning — Your Gold Listing is displayed above other listings that are a similar distance from where a customer is. Get found for all the services you provide. 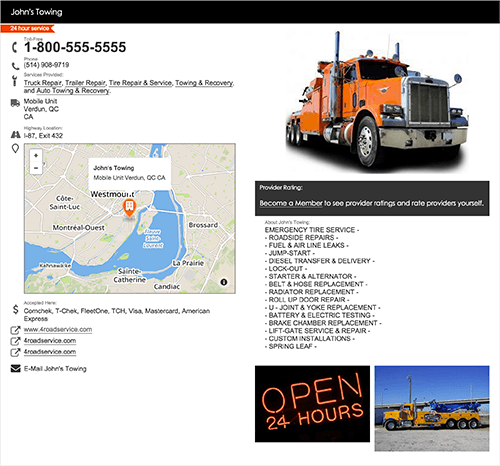 Your company logo on your provider page and in search results. 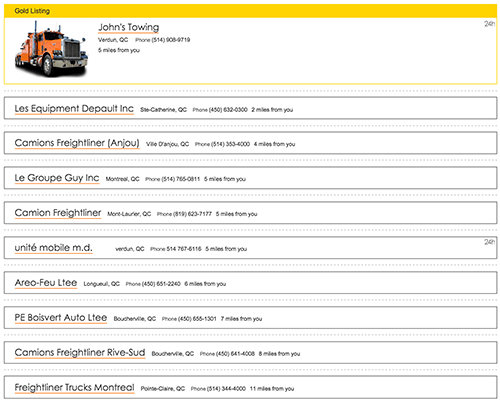 Photos — Show up to 2 photos of your business to show customers where you will be working on their vehicles. A store website link: If you have multiple locations you can link to the website for this location in addition to your main website. Links to your social media profiles. Promotional text. Do you have a sale going on right now? You can let your customers know here. No sale right now? Tell them about your excellent service. Your Gold Listing is displayed prominently in search results. Nice print formatting. Customers no longer have to load a separate page for printing, they just print out your listing page and it comes out looking good. A longer description you can use to make your business stand out from the competition. A map of your location: We turn your address into Latitude and Longitude co-ordinates and show your location on a map for customers. No outside advertising on your provider page: Your provider page is about you and only you. No outside advertising is displayed on your provider page. Your Gold Listing has what you need to reach new customers. Control Panel in Every Package! All of our listing packages include a robust control center giving you full control of your account.